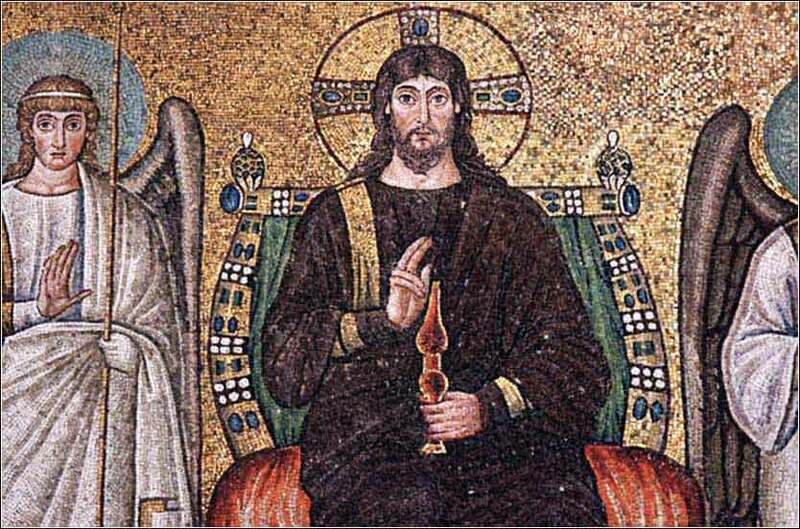 Mosaic of Christ enthroned, surrounded by angels, in Sant'Apollinare Nuovo, Ravenna, Italy, ca. 500 AD. Our "Virtual Sunday Church" is contemporary this week, with a worship song from Bethel Church (Assemblies of God) in Redding, CA. I will give, you all my worship. I will give, you all my praise. You alone, I long to worship. You alone, are worthy of my praise. I will follow, all of your ways. I will bow down, and I'll hail you as king. I will serve you, I will give you everything. I will trust you, I will trust you alone. Have mercy on me, Oh Lord, for I am a humble and miserable sinner. [At this point, pause to remember specific sins you have committed during the previous week and speak or think them.] I renounce all of these sins, heavenly Father, and repent of them, and I promise to make every effort not to repeat them. Have mercy on me, pardon me for these offences and any I might have omitted from forgetfulness or ignorance; in the name of Jesus Christ, my Lord and Savior, I pray for forgiveness. And I pray that your Holy Spirit may dwell with me in the coming week, to comfort me, to give me strength against temptation, and to guide me into the path of righteousness. Lord, in utter humility I thank you and glorify you, that you might hear the prayer of one so small as myself, amidst the billions of souls on this planet among billions of stars in one of billions of galaxies in your universe. Let me go forth in your peace, keeping your Spirit always in my mind; and bless me, I pray, that I might always follow your will and live in the radiance of your blessing. To each one of us grace was given according to the nature of Christ's gift. It was he who gave some to be apostles, some to be prophets, some to be evangelists, and some to be pastors and teachers, to prepare God's people for works of service, so that the body of Christ may be built up until we all reach unity in the faith and in the knowledge of the Son of God, when we become mature, attaining the whole measure of Christ. As a result, we are no longer to act like children, tossed here and there by waves and blown around by every wind of doctrine, by the trickery of men, by craftiness or deceitful scheming; but speaking the truth in love, we are to grow up in all aspects into Him who is the head, Christ himself. The body is held together by every joint and ligament, each of them supplying a needed role; and thus Christ has appointed the growth of the body, building itself up in love. The critical part of this passage is the first few words: "To each one of us grace was given." Christ did not leave anyone without some work to do on earth. Our natural inclination as human beings, living in a society, is to value people according to some scale of importance. The talented, the highly visible, the televised, the quoted . . . in fact, in the media, a cult of celebrity has sprung up, comprised of people whose only claim to fame is that they are famous. But it is illusory, and erroneous. Your work for Christ, whatever it may be, is as important as anyone's. The eyes that matter are the eyes of God, not those of the local news anchor, or a local gossip, or an applauding audience. God sees what you do and approves your mission in Christ, whether you lead millions or perform an uncredited small kindness to a stranger. Our roles stem from the nature of the gift given to us by Christ, not from some inherent degree of greatness in which we may glory or feel humiliation. "Blessed are the meek, for they will inherit the earth." Churches can easily fall into this error, for we seek by our nature a leader. But although pastors and bishops may be critically important the the earthly church, they are not greater in the eyes of God than food service workers, or the funny-looking guy in the corner with his head lowered. It is a mistake to fix our gaze upon a human being; we must remember always to fix our gaze on Christ, and to love and value ourselves and all of our brothers and sisters, no matter how humble or exalted our contribution to the body of Christ may seem in earthly terms. 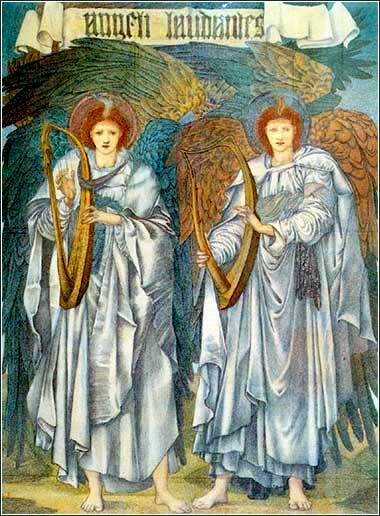 Angeli Laudantes (Angels giving praise) by Edward Burne-Jones, ca. 1898.